It was a point of real frustration, what psychologists call a ‘trigger point’. A client pushing for ever deeper insights. “We need to mine for them, reveal the hidden beliefs and the unconscious needs”, she said. “But what about all the blindingly observations and truths about your consumer? The ones you already have and have been consistently ignoring for the past two years?”, I retorted, in my head. The conversation rolled on: how research moderators let their own biases or poor questioning distance themselves from the real truth, failing to uncover the deeper needs. They would prove to be the key that unlocks the door to future prosperity, apparently. Yet here was a business posting mid single digit volume and profit declines with unrelenting consistency, with fragile to no brand momentum and struggling to create a meaningful vision, a meaningful agenda for their categories. And they want to dig deeper? Understanding of your target market can come from all sorts of directions – not just down. I mean, yes, it is possible to find unconscious needs: through gaming or role-playing, through well purposed ethnography and longitudinal studies, through metaphor and story telling. There are ways. But the question at the end of it all is: will it be usable by my brand? Will I be able to plan stuff off it that builds my brand? 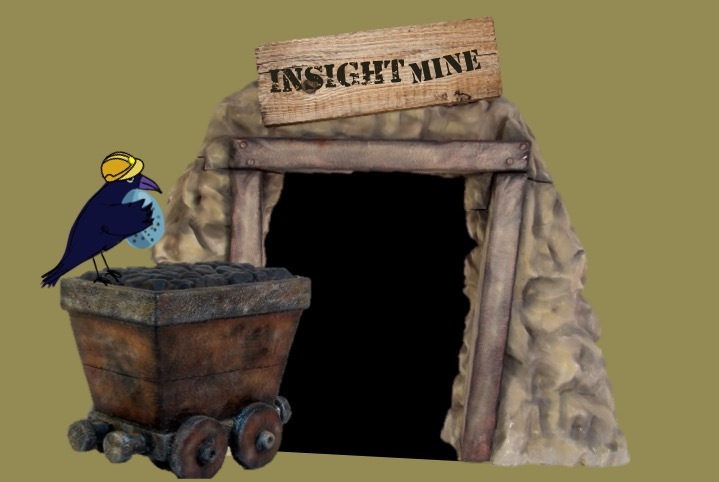 All too often, seemingly profound ‘insights’ are unusable, and therefore of no value. Me? I like shrewd observation. I like accompanying harassed parents as they go shopping with their kids, or chatting to a Grandmum about the pressures of feeding their grandchildren ‘the right things’ in the short window of opportunity between nursery finishing and Mum getting home to check. Or talking to a Big Issue seller about their journey from homelessness, from being bereft of hope and opportunity, to seeing the light at the end of the tunnel. Of sitting alongside someone sifting through their e-mails and all the requests to give or buy. Or the businessman in a forecourt shop balancing a wallet and loyalty card in one hand, with his keys and a bottle of pop in the other, whilst the Assistant asks him if he would like to fill in a customer survey to win a Grand. And I like collision. Of throwing the observations together. Of seeing what crashes out of the carnage. Of seeing where the ensuing conversation reveals about what we really think, truly believe. The juxtaposition does this: ‘you may think I’m a bit well, weird, behaving like this…but look at them, they use twigs’. Of feeling the energy that arises when apparently conflicting ideas are forced together. And challenging beliefs. To feel the nervous energy as someone realises that their belief is more of a doctrine and really isn’t supported by fact. But hell, they’re going to believe it anyway and what are you going to do it about Mr Researcher? Getting real insights is like active listening. Proper listening is hard. To switch off (or at least turn the volume right down) of the voice in your head, and concentrating on what the other person is saying. Of checking their meaning, not challenging. Of listening to the words, not developing counter arguments. Getting real insight is like that: it’s like being a detective or policeman. You’re looking for the things that aren’t said, that aren’t done as well as those things that are. It’s about setting up hypotheses and working through them. And when you’ve found the cause, prosecuting the hell out of it. Because more than anything else, a good insight is only ‘good’ if it is usable by your brand or your company. If it allows you to do and plan something, not just now, but for a few years at least. How ever you find your insight, if you can’t act on it, or are not willing to, save your time and your money and do something else. *The armour has to shine, not sure why. Posted in Research and tagged Bleeding edge, Collision, Ethnography, Insight, Observations, Research on March 12, 2015 by David Preston.